Do you ever feel inconvenient when you have to bend down to pack & unpack your luggage? Have you worried about scratches when you place your luggage case naked on the floor? Is there no space to storage their suitcase when friends come by? If your answers are YES , then SONGMICS LUGGAGE RACK helps! 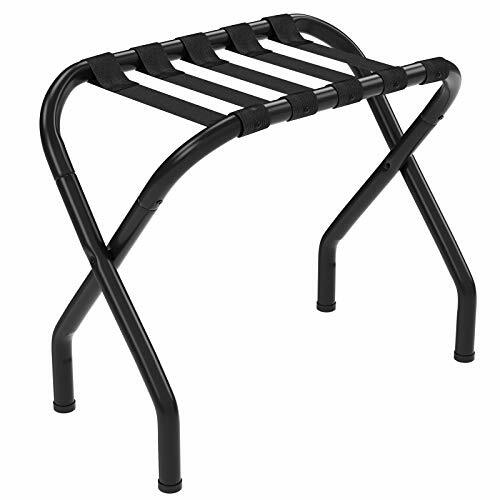 This SONGMICS luggage rack features baking finish metal tubes & heavy-duty nylon webbings, durable and sturdy. 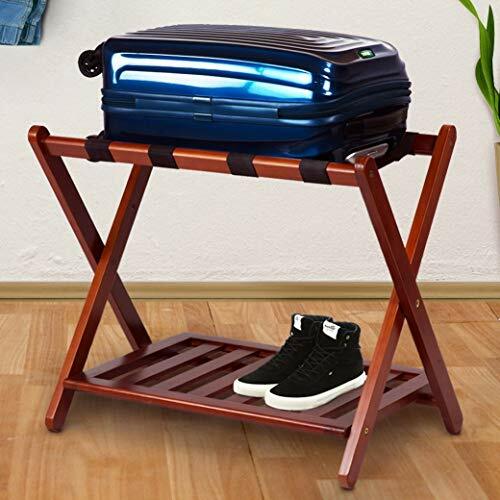 With this luggage stand, keep your luggage case off floor; makes luggage packing cozy & energy saving, especially for the ones who have difficulties bending down. When not in use, just fold it up; it occupies small space. Great addition to guest rooms, hotels, motels, vacation rentals and more. FOLDABLE &PORTABLE: Easy to fold up, space saving. FLOOR FRIENDLY: Designed with high quality PP plastic adjuster feet, keep rack sturdy and protect your floor from scratches. FUNCTIONAL: Suitable for commercial and residential. Keep your suitcase off floor, no more stooping & bending. PRODUCT SIZE: 26.9 L x 13.3 W x 22.6 H (68.2 x 33.8 x 57.5 cm ), folded size: 26.9 L x 4.5 W x 26.6 H (68.2 x 11.5 x 67.5 cm ). NEED ASSEMBLY: Easy Assembly, Clear Instruction &Allen key included. 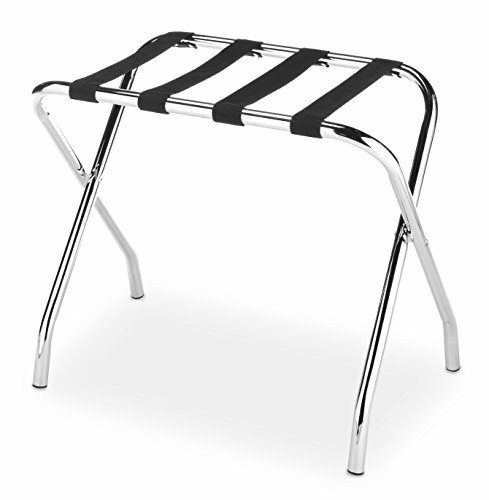 For commercial or residential use, this Whitmor Chrome Luggage Rack makes packing and unpacking a cinch. The metal material makes it durable for lasting use. It's also helps keep items off the floor. Dimensions: 26.13W x 14.88D x 21.13H in.. Metal material. Chrome, black finish. Keeps items off floor. Great for travel. Dimensions: 26.13W x 14.88D x 21.13H in. 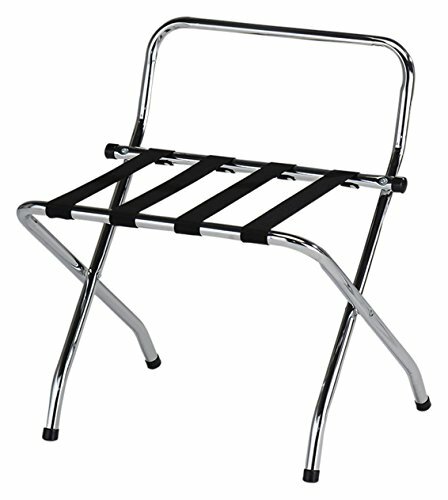 Kings Brand Chrome / Black Metal High Back Folding Luggage Rack. Welcome guests in style with this must-have, chrome luggage rack that is the same contemporary design found in high-end hotels and resorts. The rack provides easy access to belongings as luggage is held off the floor and within reach. Dimensions: 24" x 19" x 28". 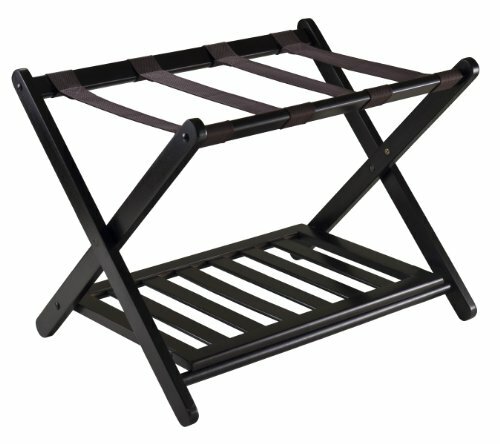 The Winsome Wood Dora Luggage Rack with Removable Fabric Basket offers great storage for a suitcase on the upper rack and a polyester basket below for storing clothes or laundry. 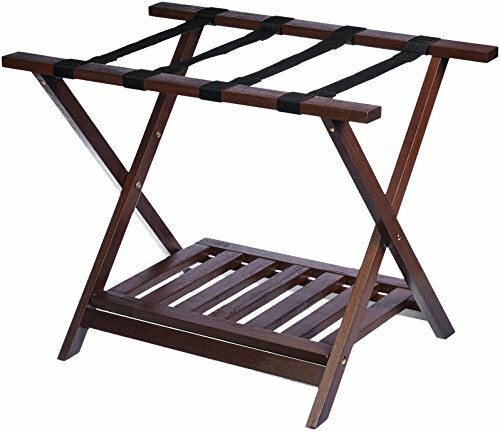 Crafted from solid wood in an espresso finish, this luggage rack folds up for smart storage when not in use. No assembly required. Winsome Trading has been a manufacturer and distributor of quality products for the home for over 30 years. Specializing in furniture crafted of solid wood, Winsome also crafts unique furniture using wrought iron, aluminum, steel, marble, and glass. Winsome's home office is located in Woodinville, Washington. The company has its own product design and development team, offering continuous innovation. Dimensions: 26.54L x 18.66W x 20H in.. Folds down for easy storage. Made of solid wood in espresso finish. 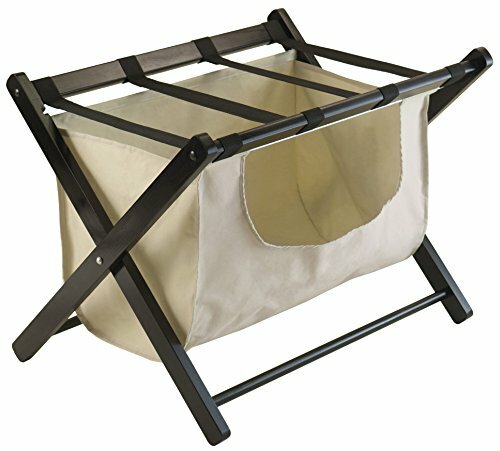 Removable polyester basket. Dimensions: 26.54L x 18.66W x 20H in. Max Weight Capacity: 110 lbs. 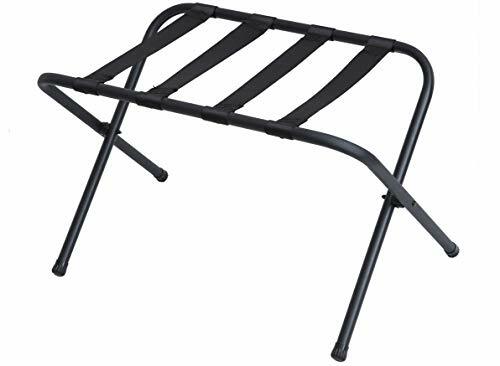 WELLAND Luggage Rack with Shelf is just the thing for your spare bedroom for guests to unpack when visiting for the week. 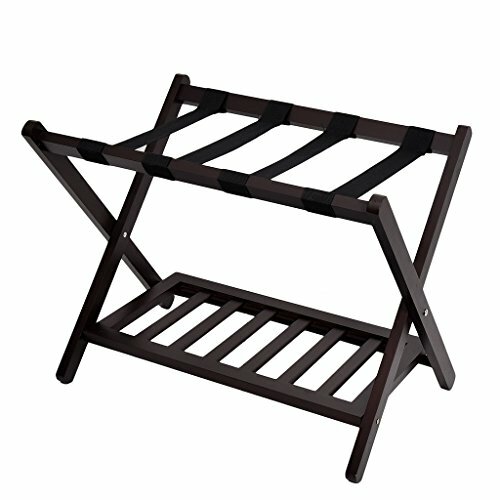 Crafted from solid wood in an espresso finish, this luggage rack has an lower slatted shelf for shoes or other personal items.It also folds up for smart storage when not in use. No assembly required. 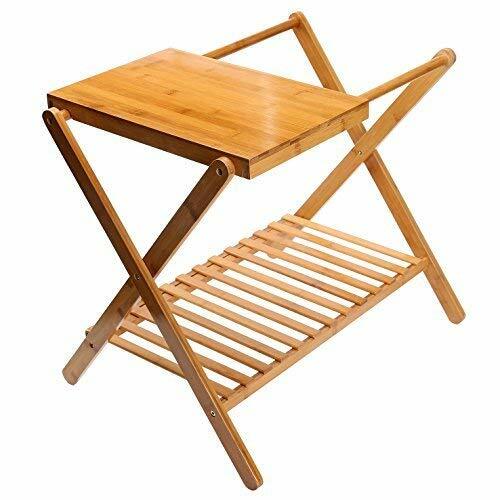 UNKU Bamboo shelf, It's not only pleased to use as a luggage rack, but also a bathroom towel holder. 14 days return acceptable for any reason, free parts replacement guaranteed. Dimensions (folded): 24"W x 27.5"H x 5" D Dimensions (open): 24"W x 27.5" H x 16"D This product will free up floor space and eliminate crouching to retrieve clothing from suitcases. It's made of aromatic cedar so its scent will freshen any room or closet, and the straps are made of Allen Edmonds pebble grain leather for beauty and durability. Do you travel so often that you never put your suitcase away? Do you have a weekend home and find yourself tripping over your suitcase which has to be on the floor? Is it time to spruce up your guest room a bit? If this sounds like you, our new Luggage Rack is your answer. Woodlore, a brand of Allen Edmonds, is well known for providing the highest level of Quality with its premium selection of Cedar Products, which are expertly crafted using 100% natural aromatic cedar wood. and no handtools are required for assembly. home. Placement flexibility as vertical or horizontal. We offer the best price! Products come from US warehouses and arrive in as little as one week! Function: adapt to a variety of home styles, multi-purpose use. Product Assurance: The product has been rigorously tested, carrying a certain weight or standing for a period of time without deformation and bending. 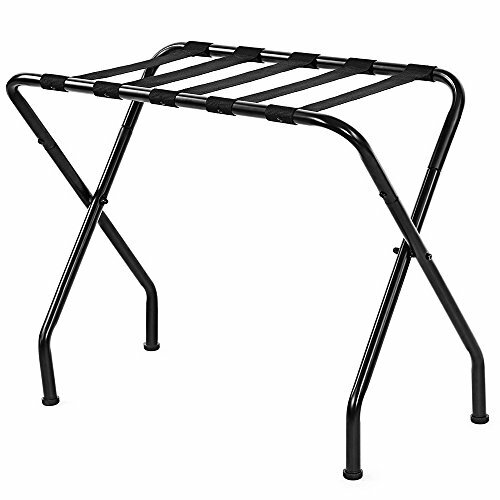 non-woven fabric quick and easy to assemble extra strong and durable,This type of rack is great for those with minimal storage space to maximize daily use.create extra storage. Uniform and reasonable space allocation allows the narrow space to be fully utilized. The sturdy steel frame guarantees overall stability. Made from selected Non-woven fabric cover, water-proof fabric tiers, this portable storage closet will meet your long term storage needs ,water-proof fabric tiers are easy to clean. Tips: Some assembly may be required, we provide install tool, please see product details. If there is any questions, be free to contact with us at any time. 26.75W x 16D x 22.25H , Weight: 8 lbs. Foldable for easy movement and storage. 27 wide top accomodates most luggage. Convenient lower shelf serves as a shoe rack or extra storage space. Solid wood construction and reinforced heavy-duty straps provide increased support. Elevated height makes packing and unpacking easy. No assembly required. 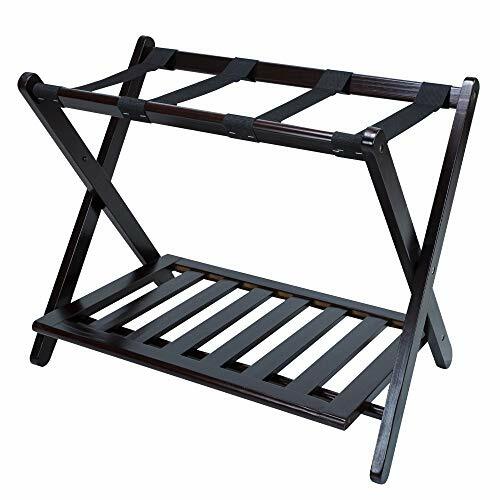 Welcome your guests with a convenient spot to pack and unpack with this Hotel-Style Folding Luggage Rack. Wide 27 top accomodates most luggage. 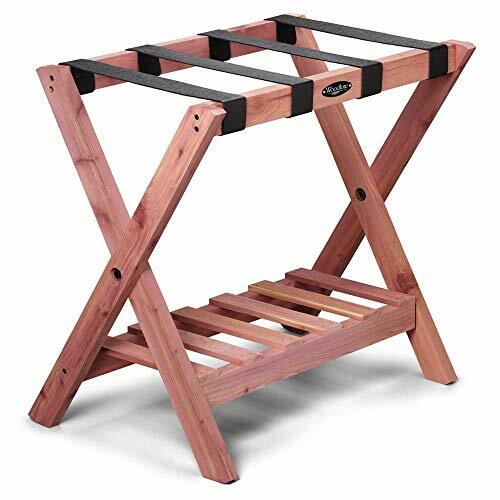 Sturdy construction supports up to 150 pounds on the top shelf and 50 pounds on the lower for worry-free use. And the convenient lower shelf doubles as a makeshift shoe rack or simply an extra space to store items off the floor. Folds easily and compactly for storage. Ideal for busy homes that house frequent visitors. Easy to fold up, space saving. Suitable for commercial and residential. Keep your suitcase off floor, no more stooping & bending.